This example assumes you have some type of print-out of at least some of the change keys in the system your trying to expand or re-create. If you don't have this you may need to go through a few keys and decode them by hand to get an idea how they are used. You should know more about where to start after you read this. 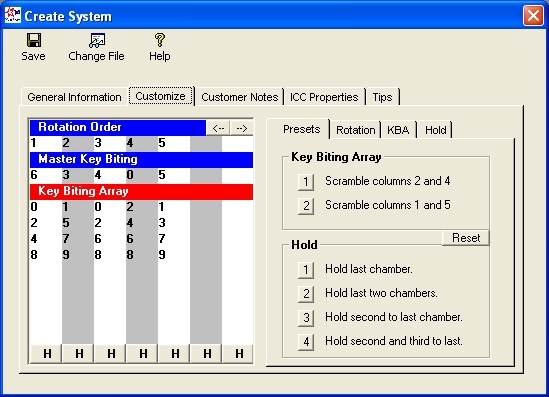 If you want to re-create an existing system, you'll want to understanding how MasterkeyPro generates its change key bittings. You also need to understand how the Key Biting Array is created and used. If you had 1,000 keys all numbered consecutively, shook them up in a box and dumped them out, it wouldn't take you a lot of thought to put them back in order, just a lot of time. The reason is, you know all the needed elements. You know the digits used are 0,1,2,3,4,5,6,7,8,9 and that they start rotating from the right side and work across to the left. This would be the Rotation Order, you even know the order that the digits are used, This would be the Biting Array. 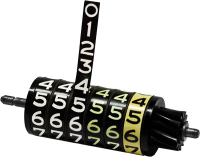 Think of this as your Key Biting Array, this is how it would look if you wanted to re-create the US numbering system. Just like the odometer in your car. This would be considered a one step system. If we had a master key of 63405, pin size of 0 to 9, and a step increment of 2, the following is what our KBA would look like. This is how most systems are created keeping the numbers 2 steps apart. This leaves you less digits to work with but it keeps your cuts farther apart from each other. In the first column we have a 6 in the master key, and it's an even number. With this information in mind you can start the first column of the KBA with even numbers, 0, 2, 4, exclude the 6 because the 6 is in the master key, then 8. Repeat this for each column in your system. It's possible that some change key cuts do have the same cut as the master key, this would be a hold and vary system where you hold some cuts the same as the master key for a column. To create a master key system by hand you would need the master key biting, know the pin size range for the system, the step increment and know the MACS used. All these factors are usually determined by the brand of locks your keying. With this information the next step would be to create a Key Biting Array (KBA). MasterkeyPro will do this for you automatically but it can also be customized if needed as you'll see in the next section. 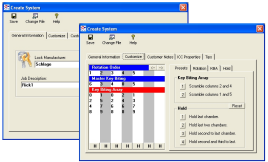 Most of the time the KBA automatically created by MasterkeyPro will work to re-create an existing master key system. However sometimes you may need to customize the KBA to match your system. That's what I'll cover here. I'll use Schlage for this example. Choosing Schlage from the Locks list will automatically enter the pin size MACS and step increment for you, make changes if needed. For example if you notice your system has some cuts 7 steps apart (like a 2 next to a 9 etc.) you'll need to change the MACS to a 7. Click the Customize tab to open the Customize window shown here. If you relate this to an odometer you can see that the first key would be 01021 (shown in bold) then 01023, 01027 etc. However, this may not always be the case. Let's look at the first group (AA) of the sample Key	Tracking report below (or click for popup window) and see what information we can get from it to help us re-create the Key Biting Array used. Things we're looking for are the Rotation Order and the Key Biting Array order. way will be all you need to do most of the time. Now for the Rotation Order. We now have the first key at the top ready to be generated 21643. Let's look at the second key 21243 the only different digit comes in the third column the 6 changes to a 2 so now you know the third column is the first column to rotate and it goes to a 2 so we have that right. If you look you'll see that the fourth column is the next column to change so mark it 2. The first column changes next so mark it with a 3. That's about all the information we can get from the first group (AA) so we must find a key from another group to see what column rotates next. I found the AB 1 key to be 25643 so with this information you can see it's the second column that is the next to change, so mark it with a 4. That just leaves the fifth column so it must be the next to rotate so mark it with a 5. Make sure you create the system and double check a few keys when we're finished. Now let's do some checking. If you're right the third column should progress from a 6 to a 2, 0, then 8. If you look you'll see that it goes 6, 2, 0 then 6, 2, 0. Don't get worried about the missing 8, it's not shown here because it violates the MACS, so you're okay. Check the next column (fourth) and see if it goes 4, 2, 6, 8. It does so you're okay. The next column to rotate is the first column, see if it goes 2, 0, 4, 8. You'll see that it does not match. In order to make them match up we must change the first column to a 2, 4, 0, 8 (Shown below). Note: To make changes to your system after it's been created simply choose the New button and click the Edit System button to bring in the existing information.